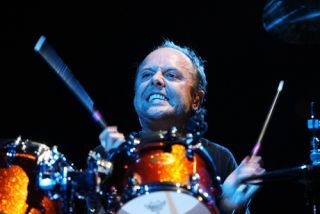 Pick up the latest issue of Rhythm and you'll find Lars Ulrich gushing about his love for Iron Maiden and Nicko McBrain. The Metallica sticksmaan had so much to say that we couldn't fit it all into the magazine, so you can enjoy the rest right here. Going back to the Garage Days EP - didn't you start playing Run To The Hills? "We've always been around English people. In those years all our tour managers, our minders, our crew guys were all Brits and so there was always a very strong sense of English cynicism and sarcasm and a bit of twisted humour. We all incredible Maiden fans, obviously, and I don't think Metallica would be where Metallica is today if it wasn't for Iron Maiden, not only paving the way but also for just inspiring me in 1981 to form a band. We were sitting there recording the Garage thing in LA and it was a pretty loosey-goosey set of sessions and one day we started going into Run To The Hills which is one of those things that anybody could attempt at any time. "Sometimes those harmonies could be a bit tricky for a few of the guitar guys and I think a few of them were slightly off-whack. There may have been a couple of people who thought that we were taking the piss but obviously it was meant as a tribute in our own perverse Metallica way having been around basically nothing but English people for the better part of the previous five years. I'm sure no ill will was taken. About a year later, I think it was right when we finished the Justice album, I had been in New York mastering the album and Maiden were playing at the Meadowlands in New Jersey, it was probably July of '88. I went out and went to the gig. Obviously at that time, whenever you went anywhere you were pretty lubed up and continued to be as lubed up as possible. I was standing behind Nicko, they were doing the Seventh Son Of A Seventh Son tour, and I was watching him, hanging out. I think Run To The Hills was the first encore and he handed me the sticks and pointed. I was like, 'huh?' I crawled up the stairs and I remember hearing Bruce introduce me, then I started playing Run To The Hills in front of 20,000 people. I may have gotten just about as far as I did on the Metallica version that came out. The whole thing was a complete clusterf*** and I don't even think we got through the first verse. Note to self, don't play drums in public when drinking! We gave it our best shot but I don't think we even made it to the first chorus." And you've toured with Maiden? "We did a bunch of shows with them actually right after that. We did a bunch of shows. Justice came out in August '88 and there were a bunch of European festivals we played with them on the Iberian peninsula, San Sebastian, Madrid, Barcelona. We played bullrings in Spain, Iron Maiden, Metallica and Anthrax, which was pretty cool. I was the biggest Maiden fan. When they were playing on the West Coast I would go hang with them. One time I drove to Las Vegas, they were playing down there. They were always super welcoming and social so when we played those shows with them in '88 and got a chance to hang out, that was very cool." Ever talked drums with Nicko? "That's not my bag so much. I'm more interested in how they function as people than how they tune their snare drums so when I'm around other drummers that inspire me I'm more interested in who they are and what makes them tick, bigger picture stuff than what their secret snare tuning is. I don't think I have that relationship with a lot of other drummers, it doesn't do that much for me, that type of stuff. I can barely tune my own snare drum! Being around creative people is inspiring to me and I love to try to understand what their inspirations are. I'm very interested in musical lineage and history. I'll sit and talk with Nicko about when he did that with Trust or when he did this with so-and-so. Every time I've even looked at his drum kit, it's so overwhelming and frightening. He's got one of the biggest set ups in rock'n'roll - I try to be a little more low-profile - but I've never done any of the technical wizardry stuff with them." "I have spotted that, yes. It's the feeling, you get up on stage in front of 20,000 people and it goes to another level. Nicko was always great and obviously still is great because he has personality and there is an approachability about him. People really felt that he was enjoying himself and there was something slightly nutty about him but never Keith Moon level, it was never scary. He just really enjoyed what he was doing. I've always really enjoyed playing. People talk to me about, 'Why do you stick your tongue out while you're playing?' I don't have an answer for that, it just happens. I'm the one that has to sit and look at the pictures, I know it looks ridiculous, it just happens. I turn into this little gremlin. There is no cosmic thought or premeditated thing." "We've got our thirtieth anniversary shows coming up in San Francisco in December, so we've got a perfect rest of the year. We've got a couple of shows, get of the house for the weekend type of thing, we're doing this Lou Reed thing which is absolutely fantastic and then it's the eternal back to writing songs and making another record thing." It hasn't been 30 years already has it? "Yes it has. Me and James Hetfield met each other in May of '81 and decided to try to give it a shot in October '81, so we're celebrating our thirtieth anniversary with a series of shows in our hometown in December. It's frightening isn't it?"